Blowout Sale! Save 76% on the LED Work Light with Magnetic Stand 15W 24 LED Rechargeable Shop Light Portable Outdoor Camping Spotlights with Dual USB Port and Emergency SOS Mode by Hallomall at tradingmart.net. MPN: GD929Green. Hurry! Limited time offer. Offer valid only while supplies last. Hallomall 15W 24LED Multi-functional Rechargeable Magnetic Work Light Bright LED Work Lamp for Outdoor and Indoor even if at the power cut night. Bright LED Work Lamp for Outdoor and Indoor even if at the power cut night. Portable and Durable Work Lamp--aluminum alloy shell, IPX5 waterproof, lightweight, easy to carry or hanging, widely used for fishing camping and other outdoor activities. As a Back up Power Bank--2 USB ports, charge two mobile devices at the same time. Roadside Emergency Gear--4pcs flashing LED (2 Red and 2 Blue), the best gear for the roadside or other emergency situations. Kind reminder: It would be better to use the original charger and do not charge the light for over 24 hours. 1. At Hallomall, we will always stand behind our products within one year. 2. As to the Amazon Fulfillment order, if the order time is over one month and the return window is closed, please click the contact seller customer service for help by choosing 'product details' subject to request a replacement or refund. 15W 24LED super bright LED work lights with 3 modes(High/Low/Strobe), Magnetic base and 360 degree rotating design to meet kinds of lighting needs. Built in 2pcs 18650 rechargeable lithium batteries and with 2 USB ports, could be used as a battery charger for mobile devices. Special 2 Blue and 2 Red Flashing LEDs, the best gear in a roadside emergency and wild exploration. 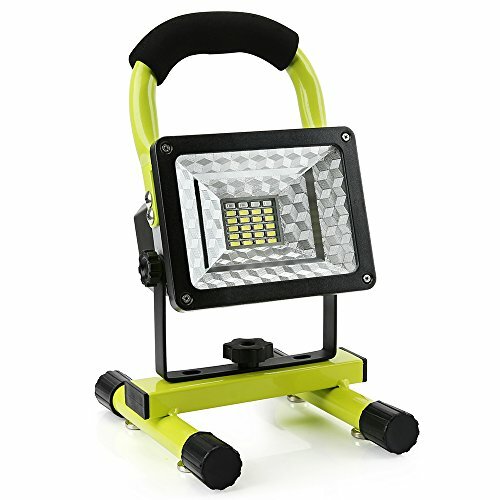 Portable and lightweight spot light, put onto ground with the stand or hanging for camping, fishing, construction, job site work lighting. IPX5 waterproof flood light widely used for both outdoor and indoor in workshop, garden lawns. Wall charger& USB cable included.